Nora Benson, a junior from Chicago majoring in engineering, displays a prosthetic hand created at the Illinois MakerLab. The next industrial revolution has arrived at the University of Illinois, but it’s not happening on the side of Green Street that anyone familiar with the Urbana campus would expect. Located on the third floor of the Business Instructional Facility, the Illinois MakerLab is touted as the world’s first 3-D printing lab in a business school. Founded in spring 2013, the lab’s objective is to provide U. of I. students with the knowledge and resources to be at the forefront of the emerging “maker movement” by teaching them how to design, manufacture and market 3-D printed objects, said Aric Rindfleisch, the John M. Jones Professor of Marketing in the College of Business. Rindfleisch, the co-founder and executive director of the lab, said 3-D printing democratizes innovation by empowering individuals with the knowhow and tools to manufacture ... well, pretty much whatever they imagine. “3-D printing is a technology that is changing both our economy and the way that goods are made, as well as who makes them and how they’re distributed,” he said. According to Rindfleisch, 3-D printing technology has important implications for many facets of business, including manufacturing, distribution, retailing and consumer behavior. In addition to training the workforce of the future, Rindfleisch also believes the 3-D printing movement fosters an entrepreneurial spirit. The College of Business currently offers two 3-D printing courses: Digital Making, which teaches skills in different aspects of digital making; and Making Things, a team-based course with students from business, design and engineering forming an interdisciplinary team. Students conceptualize, design, prototype, manufacture and market a new product. The end-of-semester capstone project includes a pitch video to potential investors. Cameron Alberg is a senior from Chicago studying engineering mechanics. And thanks to the Making Things class, he’s also the co-creator of “Booty,” a slim, clip-on wallet designed for the active student. “As soon as I saw the Making Things class, I thought, ‘This is what I want to do,’”he said. Outside of taking a class, there are many other ways that students can become involved with the lab, said Vishal Sachdev, director of the Illinois MakerLab. “It also fosters a lot of peer-to-peer learning, which is how partnerships start,” Rindfleisch said. It also helps that students do most of the training, Sachdev said. “It’s not uncommon to see students not only teaching their fellow students, but also graduate students, faculty and staff,” he said. 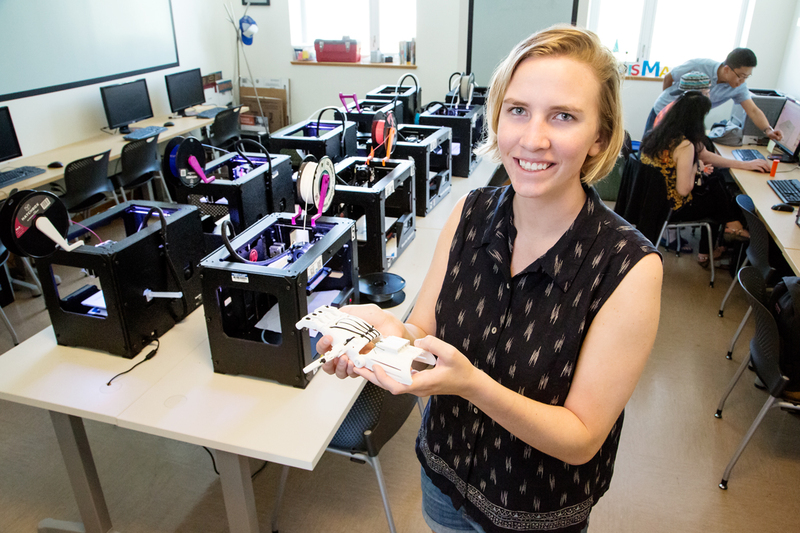 For the capstone project of her Digital Making class, Benson and her classmates gained experience creating affordable, customizable prosthetics by working with a nonprofit group to custom-print three replacement fingers for a North Carolina man. applications for 3-D printing,” she said.